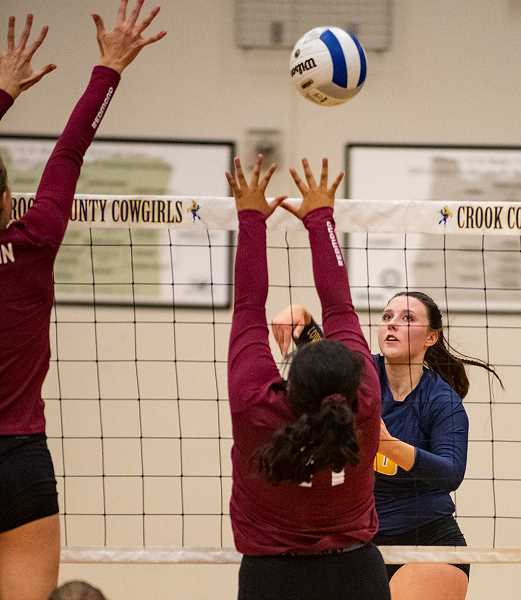 The Crook County Cowgirls rebounded from a loss to Ridgeview on Tuesday, sweeping the Redmond Panthers Thursday evening, 25-9, 25-18, 25-9, in a key Intermountain Conference volleyball match. "The first and third game were good," said Crook County head coach Baylee Dunkel. "The second set was eye-opening. We saw what happens when we play down. We have to take that into practice next week and try to work over those things." The host Cowgirls rolled out to an 8-0 lead in the opening set and looked like they would dominate the entire match. However, late in the set, senior outside hitter Kerigan Waibel went down with a knee injury, and, for a time, the Cowgirls struggled. Crook County held on to win the opening set 25-9 but had difficulty scoring in set two. The set was tied 11 times before Crook County finally took the lead for good at 18-17 on a Redmond service error. The Cowgirls were then finally able to take control of the match, scoring six of the next seven points as they rolled to the win. The final two points of the set were a kill by Lily Cooper and an ace from Mekynzie Wells. By set three, Crook County had regained their composure and once again opened up a big lead. The Cowgirls were leading 12-2 when they suffered their second injury of the night. Cooper dove for a ball near the net, banging her head on the floor. Initially, she looked like she would remain in the game, but it quickly became apparent that she was not going to be able to continue. Following the injury, the Panthers made a brief run, closing to within 15-7 before Crook County was able to get back in rhythm. With players missing, Dunkel moved Wells from libero to outside hitter for the final set, and the strategy worked. The 5-5 senior had two kills in the set as the Cowgirls went on to win by a big margin. "I almost think that we play better when I have to make those split-second decisions," Dunkel said of the decision to move Wells to outside hitter for the third set. "I'm really proud of the girls that they did step in and play spots they have never played before." Waibel had two kills before her injury, while Cooper had five kills and a block before she left the match. 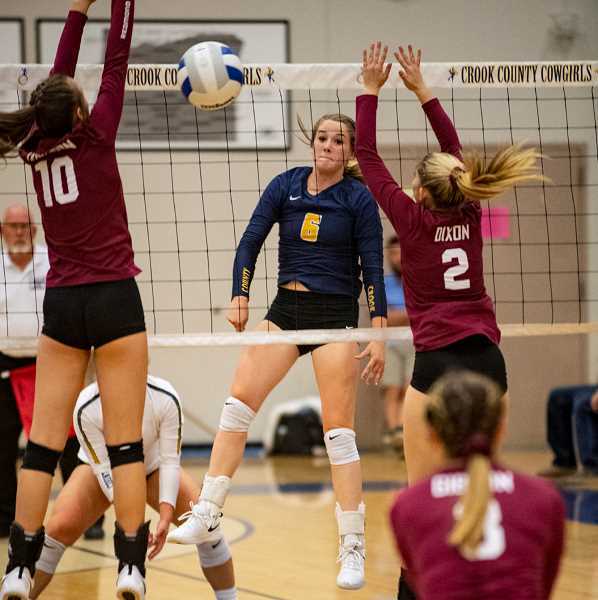 Raegan Wilkins led Crook County with 12 kills, while Kenna Woodward finished with 11, and Liz Barker chipped in with four. "In game one and game three, we were just great," Barker said. "We came in and did everything we were supposed to do. But in game two, we weren't all there. I think we thought it was too easy or something." Redmond had just 10 kills as a team. However, the Panthers did a good job of blocking Crook County hitters, finishing with five kill blocks in the match. Kacie Stafford and Wells each had 10 digs in the match, while Wilkins finished with nine. Wells also had six aces as the Cowgirls finished with 12 as a team compared to just one for the Panthers. With the victory, Crook County improved to 11-3 overall and 4-1 in conference play, while Redmond fell to 0-5 in league and 0-12 overall. The Cowgirls played in a tournament in Gresham on Saturday, then do not play again until Thursday when they go on the road to take on The Dalles Riverhawks in a 6:30 p.m. match.